The danger of adding game dynamics to sites is that it changes the motivators for doing an action. By it’s very nature, the incentives make you more likely to do the behavior the designers are targeting. The designers think… This is great! More people are interacting with our thing we built. Fantastic! We won teh internets! Down this road lies the problem. Foursquare incentivizes you to check into places. The big sell for Foursquare is the social interaction layer. The BIG PROMISE of Foursquare is that you’ll have serendipitous interactions because you’ll see that your buddy is at the coffee shop just down the street from you. I’ve never seen this promise delivered on in Portland simply because we don’t have enough density. 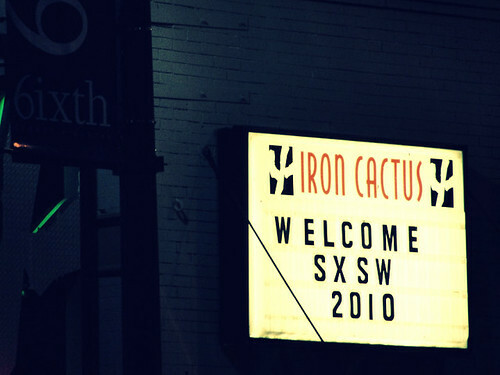 It does work in one place for a few days each year, Austin, TX at SXSWi. The game layer is added to keep Foursquare interesting for the other 360 days a year for those of use who don’t live in NYC or SF. You’re essentially playing a game with a leaderboard of friends. I could care less about this and only use Foursquare at SXSWi. The thing is, the point are the only value for most people, in most cities, most of the time. The BIG PROBLEM is that there are people who are playing Foursquare at SXSWi like it’s only for the game layer. They’re checking in for points. I don’t play this way. I don’t give a fig about points. My assumption is you check into a venue if you want people to come find you and hang out. This is the only reason I check in ever. This difference of expectations led to a small faux pas. My NYC buddy (who shall not be named) checked in at the Iron Cactus. I was hoping to see him while I was in Austin, so I tracked him down. Unfortunately, he was in the middle of a serious business conversation and couldn’t really be interrupted. He had checking in for the points, not because he wanted that serendipitous connection to happen. FourSquare really can work if everyone has the same set of expectations. The points for checking in distract from this. Is this the end of the world? It kinda is. This experience left a pretty sour taste in my mouth. I felt like a dope, like I’d crossed some social boundary. Will I use Foursquare next year at SXSWi? Maybe. It really faded in its usefulness since its debut in 2009. I have serious doubts about how relevant it will be to the early adopter crowd by next year. Web app builders would be well advised to keep a check on game mechanics to make sure you aren’t incentivizing at the demise of the core value of your offering. What’s worse, don’t spend your precious dev resources building a game around a product that don’t have its core value worked out yet.